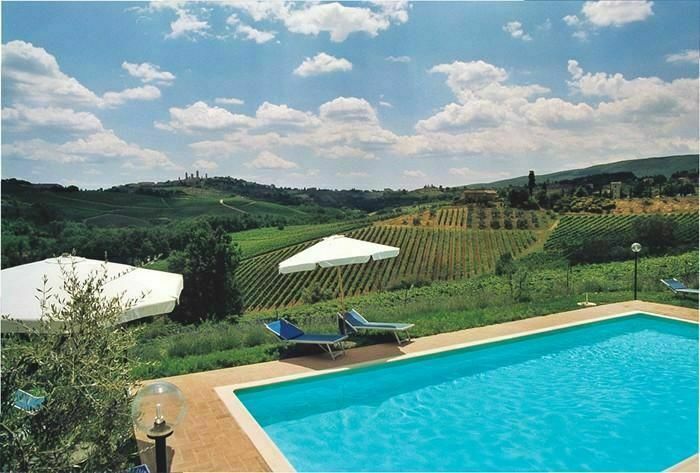 Nice property situated in panoramic location, near the centre of the lovely town of San Gimignano. The property comprises 3 comfortable apartments (one is occasionally occupied by the owners of the property) offering beautiful views over the surrounding landscape. All of the apartments are furnished in a Tuscan rustic style. Distances: San Gimignano with all kinds of shops and excellent restaurants 3 km, Volterra 20 km, Colle Val D’Elsa 6 km, Siena approx. 40 km, Florence approx. 60 km. At guests’ disposal: furnished garden, nice swimming-pool (5 x 12 m – maximum depth 1,45 m – open from 01/05 to 30/09) set in panoramic location, private share of terrace for each apartment, barbecue. Possibility of connecting the two apartments to allow a total of 6 persons. Parking close to the property. Extra services: maid service available by arrangement (€ 11,- / per hour to be paid locally). Baby bed and extra bed available upon request (€ 100, - / per week to be paid on the spot). 95 m2. 1st floor: large and bright living-room with kitchen corner (freezer), dining area and fireplace, 2 double bedrooms, large bathroom with tub and shower. Private furnished outdoor area.